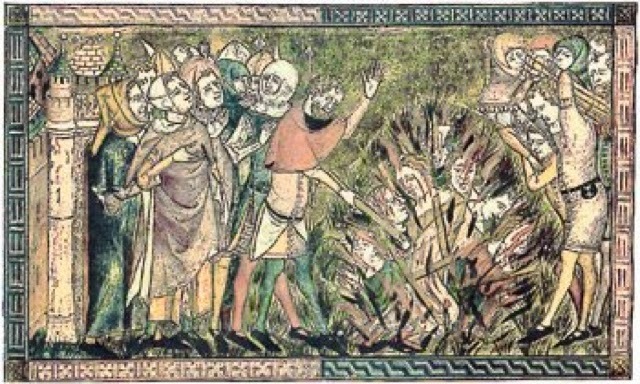 This illustration depicts the burning of Jews in the 14th century during the black death pandemic. Jews were blamed for the plague and were believed to be less-susceptible to contracting the dreaded disease than their neighbors. (Historians believe Jewish ritual requirements may have improved their personal hygiene). Jews were also accused of poisoning their neighbors wells (which people thought could have been the source of plague). No one, at the time, knew how plague was caused or what could be done to avoid it. People in Strasbourg took action against the Jews for allegedly causing and/or spreading “The Pestilence.” As a result, thousands of people were burned to death on February 14, 1349. A medieval drawing, circa 1375, from a medieval manuscript illustrates the event. The Liber chronicarum [also known today as the Nuremberg Chronicle], a universal history compiled from older and contemporary sources by the Nuremberg doctor, humanist, and bibliophile Hartmann Schedel (1440-1514), is one of the most densely illustrated and technically advanced works of early printing. It contains 1809 woodcuts produced from 645 blocks. The Nuremberg entrepreneur Sebald Schreyer and his brother-in-law, Sebastian Kammermeister, financed the production of the book. Michael Wolgemut and his son-in-law Wilhelm Pleydenwurff executed the illustrations in around 1490, a time when their workshop was at its artistic peak and the young Albrecht Dürer was just completing his apprenticeship there. The views of towns, some authentic, some invented or copied from older models, are of both artistic and topographical interest. This brilliantly colored copy, owned by Schedel, contains valuable additional matter, such as Erhard Etzlaub's map of the road to Rome. Along with the rest of Schedel's library, the book became part of the library of Johann Jacob Fugger, which in 1571 came into the possession of Duke Albrecht V of Bavaria. Illustration - "Burning of the Jews" - from the Nuremberg Chronicle, by Hartmann Schedel, published in 1493. Bos, Carole "Accused of Spreading Plague - Jews Burned in a Pit" AwesomeStories.com. Dec 05, 2014. Apr 21, 2019.